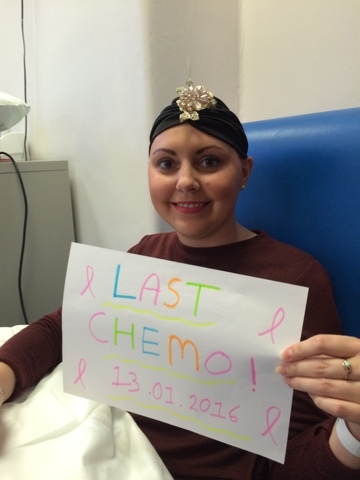 Last Chemo! | Can I Still Drink Wine? 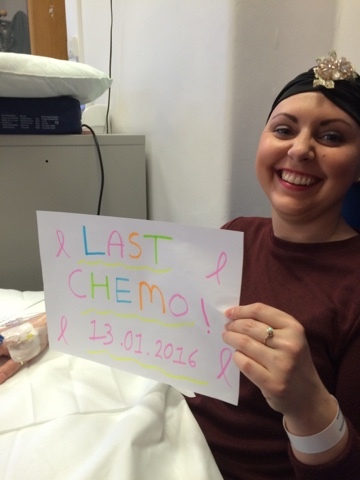 On Wednesday 13th January 2016 I had my last round of chemotherapy. (I feel like I need to write the date in full as its such a milestone.) That's 3 rounds of EC and 3 rounds of Docetaxel over and done with. I feel like I should be over the moon with joy and celebrating like I've just won an Oscar but I just feel knackered. On the day of my last chemotherapy I pretty much skipped to the ward. This is a delightful change to how I usually feel. I knew I still had three weeks of side effects to deal with but at least it would be for the last time. I really wanted to get the nurses a little something to thank them for looking after me over the last few months. I bought them two tins of Quality Street for Christmas so I didn't really want to get them chocolate again. So with a little help from the lovely ladies at my support group (YBCN) I settled on a hamper. I put in a few useful things that I thought would come in handy as well as some treats. They seemed really made up with it so I was pleased. I had my Herceptin injection first. It seemed to sting more this time but once I told the nurse she slowed it right down, which made it a lot more comfortable. The Docetaxel was administered as normal. 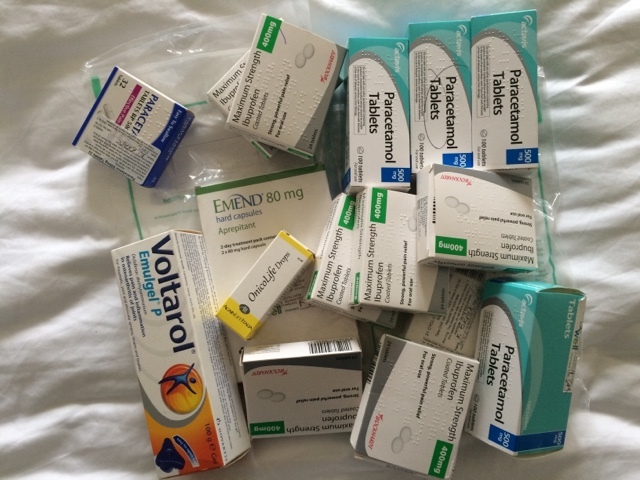 - You're ill for longer on Docetaxel (Tax) On EC I felt ill for about a week. On Tax I felt ill for about two weeks. Although the first three days after chemo you don't feel too bad. Then boy does the Tax truck hit you! - YOU DON'T FEEL SICK!! 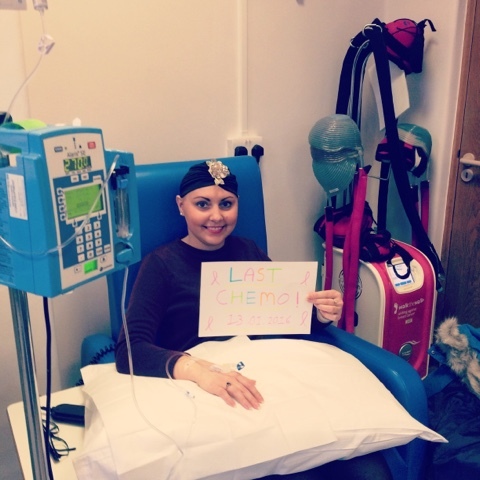 This was the best thing about coming off EC chemo. EC made me feel nauseous. Tax didn't. Hallelujah. - Bone/muscle pain. This was horrible. My whole body ached from top to bottom. Think flu aches but a lot worse. My top tip would be to take painkillers before the pain sets in. This made my fifth and sixth chemo a lot more manageable than my fourth. I also spread out my painkillers throughout the day. - Extreme fatigue. This was worse on Tax than on EC (and I thought the tiredness on EC was bad) This, along with the bone pain, means you feel like a 90 year old. - Your hair starts to grow back. With EC chemo your hair is guaranteed to fall out. However, that's not the case on Tax. The hair on my head has started to grow back over the last few weeks and, although there's not enough for me to go wig-less yet, I'm glad it's started to make an appearance. I've missed you hair! - Loss of eyebrows and eyelashes. What Tax brought back with head hair it takes away with eyelashes/eyebrows. My eyebrows and eyelashes went quite sparse with EC but there was still quite a few hairs clinging on. 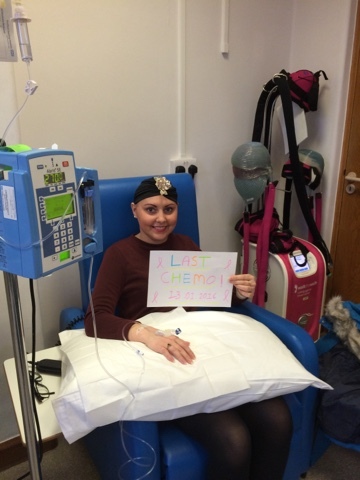 Enter my fifth chemo and they are no more. Here was me thinking I'd got away with it. - Nail changes. I've now got two ridges on each nail. One for my fifth and sixth chemo. One finger nail on my right hand has turned white half way down meaning it has started to come away from the nail bed. A few of my other nails look like they are following suit. My thumb nail is turning black too. I quite liked my nails. It's a shame it looks like they have decided to fall off. - Constipation (sorry). Tax provided some fabulous bathroom experiences. Constipation, diarrhoea, bleeding. Lots of bleeding actually. I won't elaborate too much but it's a good job we have two toilets in our new house. - Taste changes. This happened on EC but was a lot worse on Tax. My tongue was white and fluffy. Everything tasted of cardboard. Plus, to coincide with the body aches I also had pain in all of my teeth. As well as my gums. I brushed my teeth after every meal which helped. - Chemo brain. Yeah that's still happening. Don't ask me to remember anything. - Watery eyes and nose. I'm not sure if this is a side effect of Tax or Herceptin. Either way when you see me I promise you that you haven't made me cry. Apparently this is just what my eyes do now. - Hot flushes. Enter the menopause. I didn't think I'd have to deal with this at 27 but here we are. Overall I actually found Tax a lot more manageable than EC even though it's supposed to be the stronger chemotherapy drug. But I think that's just personal preference as I find pain a lot easier to deal with than sickness. 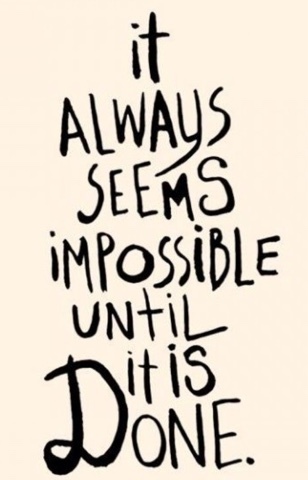 Going forward I'm still having my Herceptin injections and I'll be having my second Radiotherapy consultation on Friday.